Tonsure means to cut off someone’s hair. 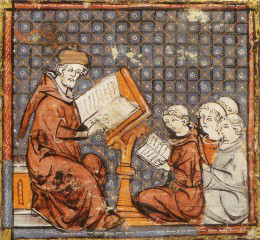 Monks and nuns in the Middle Ages generally showed that they were monks by cutting their hair short (when most people wore theirs long). Christian monks got a special short haircut by shaving a bald spot in the middle of the back of their heads. Because you could not be king (or emperor) if you were a monk, sometimes kings forced their rivals to get their hair tonsured. So that way nobody would try to make them king. Among the Franks, just having short hair by itself seems to have been enough to keep you from becoming king. And among the Visigoths, both men and women had their hair cut off as punishment for a wide variety of crimes. And again, tonsure would keep men from becoming kings. It’s possible that this idea that cutting your hair is bad comes from the Greeks and Romans. They cut the hair of people who were enslaved, to make them look different from free people. Buddhist monks and nuns in India and China and Central Asia didn’t get tonsures, but they often shaved their heads completely. That’s pretty much the same idea, that they were setting themselves apart from regular everyday people. Learn by doing: what do we learn about people today from their hairstyles? Cite this page: Carr, K.E. What is tonsure? 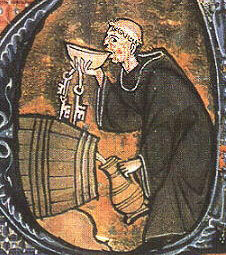 Medieval Christianity and hair. Quatr.us Study Guides, August 23, 2017. Web. April 25, 2019. Please accept my apologies for the delay in replying, Easter is an extremely busy time for all of us here. My thoughts on this image are so extensive that I could probably fill the pages of an entire book, but I will try to be as brief as possible. My thought process can be broken into several aspects: research, evidence and practical considerations. The second part of the process was to shave the top of the head with a knife known as a rasorium or novacula, leaving a bare patch surrounded by a ring of hair symbolising Christ’s crown of thorns. This two-stage clipping and shaving is described in “The monastic constitutions of Lanfranc” available in translation by Dom David Knowles, Clarendon Press 2002. Your image comes from manuscript MS Cotton Cleopatra C.XI folio 27 verso, held in the British Library. It was previously available to view on their website, but on being informed of the error in its description they removed the image and it has not been replaced. Urban Tigner Holmes Jr, in “Daily Living in the Twelfth Century” states that shaving was something of an ordeal, with only hot water used to soften the beard and the result was often painful, quoting several 12th/13th century works in Anglo-Norman French such as the Roman de Renart XVI verses 375-378 and the Conte de Graal verses 7570-7571. Evidence for the type of knife seen in your illustration can be found in the Museum of London publication “Knives and Scabbards”, Boydell Press 2003, with blades 5, 6 and 16 in plate 54 being very close to the knife shown. It is certain from surviving blades that the sharp edge is the lower, curved side of the knife. It is clear that the knife shown in your picture is neither cutting the hair (since this would be done with shears) nor shaving the top of the head (since the monk’s left hand is in the way). On a more practical level, my own attempts to reconstruct the scene show that if shaving a colleague’s beard (right cheek and side of the jaw) I would stand behind him, hold the top of his head to keep him still and angle his head slightly to the left, then holding the knife blade almost flush with his cheek I would scrape downwards in the direction of hair growth, angling the blade tip slightly upwards to avoid contact with the ear. This is exactly what is shown in the image. which also has a link to a monastic prayer in Latin: benedictio ad barbam (a blessing for the beard). Thank you! You clearly have done a lot of work on this – very impressive! I’m completely convinced, and will change the article. Thanks for taking the time to explain! Your “monk getting tonsured” is actually a Cistercian monk being shaved around his cheek by a colleague – medieval monasteries had no mirrors so this was the normal routine. Shaving like this was carried out using hot water and a knife (called a rasorium or novacula), without soap. This image has been misunderstood by many people and is often incorrectly used to illustrate shaving the tonsure, including by the writer and historian Julie Kerr in her “Life in the Medieval Cloister”. Thanks! If you don’t mind my asking, what is your thought process here? Can you cite someone who views this image as shaving?